Photographer's Libya Ordeal: 'You're Going To Die' : The Two-Way New York Times photographer Lynsey Addario's attempt to document the retreat of Libyan rebels near Benghazi left her in the custody of Moammar Gadhafi's soldiers, who abused her and three colleagues for days, before their release on March 21. 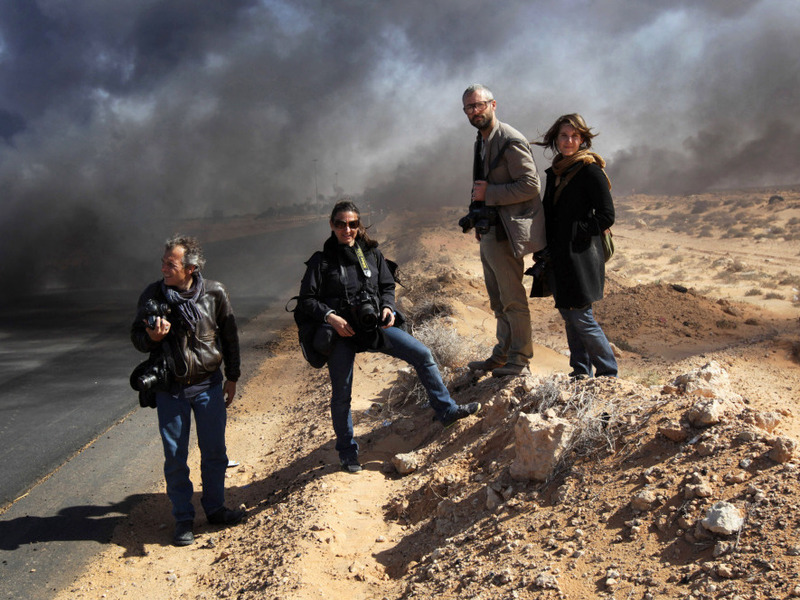 Ras Lanuf, March 11: Lynsey Addario and Tyler Hicks of The New York Times (center left and right) stand on the side of a road in Libya with Yuri Kosyrev of Time magazine and freelancer Nicki Sobecki. Four days later, Addario and Hicks were taken captive along with Times journalists Anthony Shadid and Stephen Farrell. New York Times photographer Lynsey Addario's attempt to document the retreat of Libyan rebels near Benghazi left her in the custody of Moammar Gadhafi's soldiers — who abused Addario and three of her colleagues for several days, before their release on March 21. In an interview slated to air Friday morning, Addario tells Morning Edition co-host Renee Montagne that she and fellow Times photographer Tyler Hicks, reporter Anthony Shadid and videographer Stephen Farrell were captured in the town of Ajdabiya. The journalists had been attempting to drive to Benghazi, as government forces pushed rebels eastward. But they were stopped at a checkpoint, which then came under fire from rebels. The reporters, and many of the soldiers, took cover behind a small building. "It was basically us and troops," Addario says. "And they were incredibly aggressive, and angry, and mean." "Shoot them," a tall soldier said calmly in Arabic. A colleague next to him shook his head. "You can't," he insisted. "They're Americans." They bound our hands and legs instead — with wire, fabric or cable. Lynsey was carried to a Toyota pickup, where she was punched in the face. Steve and Tyler were hit, and Anthony was headbutted. Addario says that in the first days of their captivity, the four were searched, groped and beaten repeatedly. The soldiers also threatened to behead them, or simply told them that they were about to die. For instance, there was the night that a soldier riding in the passenger seat leaned back to stroke Addario's hair and face — repeatedly murmuring a phrase in Arabic. Addario was blindfolded at the time. And when she finally asked her colleague Anthony Shadid what the man was saying to her, he translated it as "You're going to die." But soon, a pattern emerged, Addario says, in which violence and abuse were followed by offers of food and drink. "Every time we were with a group of soldiers, the initial sort of 15 to 20 minutes was horrible," she says, "and then it mellowed out a bit." The four were eventually taken to a detention center, where they were promised that they would no longer be mistreated. They were taken to Tripoli and placed under house arrest. That's where Addario and her fellow journalists confronted boredom, having quickly gone from being working war-zone journalists to people with "nothing but four Shakespeare books — and a lot of coffee, basically." But their fears of a long captivity were never realized, thanks to the efforts of the Turkish, British and U.S. governments, who worked with members of the Libyan government to secure their release. The fate of their Libyan driver, Mohammed, remains uncertain. Addario has posted a slideshow of her work in Libya on Lens, The Times' photography blog. Asked about her plans for the future, Addario says that at first, she'll take some time to be with her family and loved ones. "I think the hardest part of this job is what you do to the people who love you," she says. "When something like this happens to me, I can get through it. But it's traumatic for my parents, for my husband, for my sisters." After 15 years of experience, Addario says, she remains committed to her work. "I believe very strongly that the world needs to see what's happening," she says, adding that she is cautious in the field, and only takes calculated risks. "I will try as best as I know how to be cautious, and to not let this happen again," Addario says. "But, am I going to stop being a photojournalist? No."